Nicholas Brigg’s has provided the voices for the most famous monsters on the new series of Doctor Who, most notably the Daleks and the Cybermen. An accomplished actor and writer, his association with the worlds of Doctor Who takes him in all directions, be they the television show, theatre, musical extravaganza’s, audio plays, the list seems never-ending. 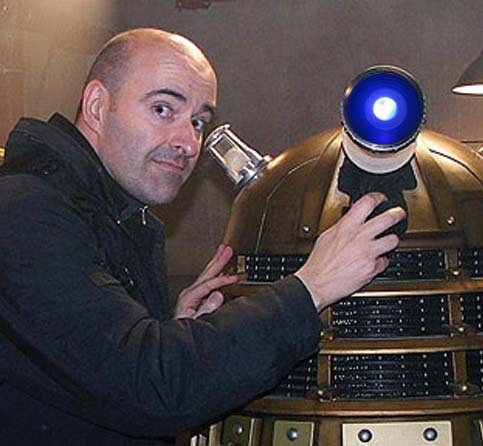 In 2006 he became executive producer of the Big Finish Doctor Who Audio range, a huge undertaking. Not only producing, but writing, directing and starring in many of the plays that come out of the Big Finish stable. In the 1980’s and 1990’s Nicholas hosted the acclaimed Myth Makers, a series of made-for-video documentaries produced Reel Time Pictures, in which many of the actors, writers and directors involved in Doctor Who were interviewed. Outside the realm of science fiction, Nicholas Briggs has appeared many times on stage as Sherlock Holmes, a role he also stars in for the Big Finish audio range. Also appeared in the film Adulthood, written and directed by fellow Doctor Who actor Noel Clarke. Not only voicing Daleks and Cybermen for Doctor Who, but many other characters and creatures, including the soon to be seen returning Ice Warriors in the new Doctor Who story, Cold War. With such a busy schedule we are delighted that Nicholas could take the time to join us at Pecorama.